Join us for this exciting evening to celebrate Rockies Edge Permaculture, and the upcoming certification course starting in April 2015 in Boulder County. 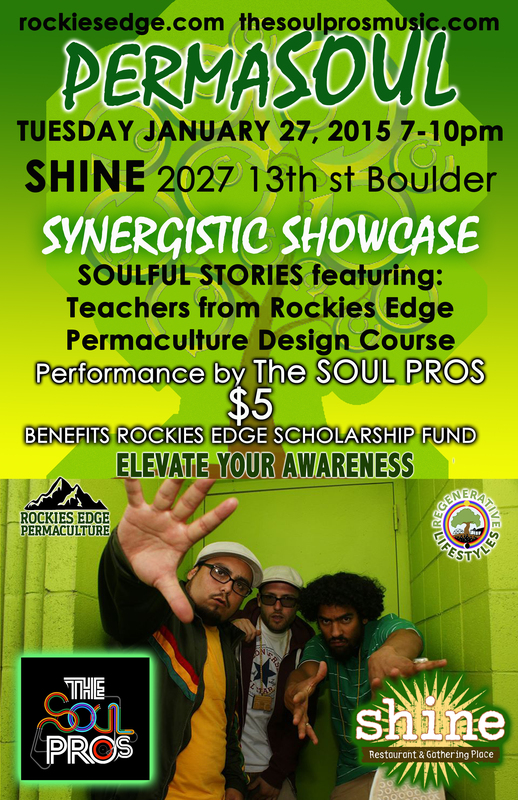 This event is open to the public and for the community, exploration into Permaculture Design through the real life soulful stories of the teachers of Rockies Edge, how they each got into Permaculture Design, where they are now, and the future they visualize. Shine Restaurant & Gathering Place is a place for us all to nourish ourselves through food, community, dance, education and celebration. Join us for an informative night full of great entertainment, food, drinks, and inspiring community. $5 cover, benefits Rockies Edge PDC scholarship fund. 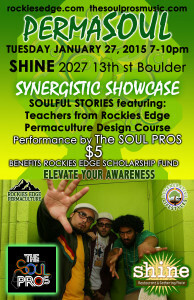 Shine is located at 2027 13th Street, Boulder, CO. Anybody who registers for the permaculture design course at this event will receive the early bird rate!